Are you still changing your backpacks to find a satisfactory one? There are many backpacks in the market，we each one may have several different styles in hand,but it is often difficult to have a satisfying and often used one，so we keep changing backpacks all the time. Now,with our versatile backpack,you can solve this problem.Our trustbag backpack is a combination of function and fashion,suitable for any formal and casual occasions,simple design with super practical, have improved the fashion of the backpack's overall shape and received a large number of teenagers's pursuit. How to use this usb charge backpack? You should prepare another usb cable and a portable battery,inside connect the coming USB cable then connect to your own power bank,outside connect your own usb cable then connect to your electronic device. Package included one backpack and a usb cable then in a dusty bag. Trustbag 100% Brand New,we are devoted to manufacturing high quality products that meet with the requirements of international top standards and providing our customers with excellent service.If any quality problems in three months there's a money-back guarantee. Wait no more,get the backpack then enjoy the convenience and lightness of your journey. Wear-resistant and wrinkle-resistant nylon fabric removes tedious lining and filling and unnecessary decoration, greatly reducing self-weight.Breathable designed panel supports your back comfortably.Padded straps distributes the weight evenly, comfortable to wear. Package included a backpack and a usb cable.Padded laptop compartment holds up to 15.6 Inch laptop.Two side sealed pockets provide a more sturdy and security load than other mesh pockets.Two front quick access zippered pockets for your ID-card cellerphone or keys.With it you can have a better organization of your items. 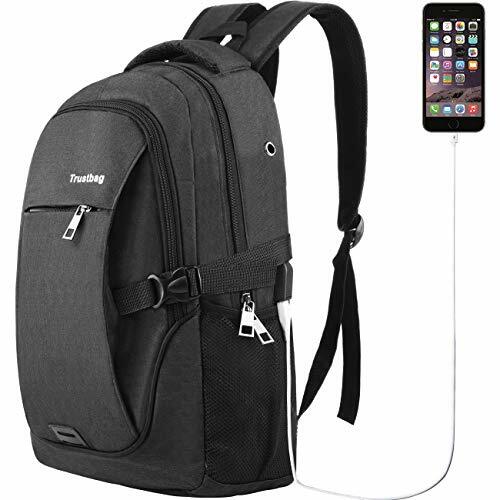 Suitable as a travel backpack,business backpack,laptop computer backpack,college school backpack and a hiking backpack for teenagers and students. The backpacks are produced by our own factory,we are strictly controlled production from material, zipper, seams to shoulder straps.If any product issues please contact our support.We here promise you a full refund if there are any quality problems in three months. If you have any questions about this product by Trustbag, contact us by completing and submitting the form below. If you are looking for a specif part number, please include it with your message.